It’s beginning to feel a lot like spring—at least in the South. The cold chill in the air has largely disappeared during the day. New grass is starting to turn bright green. While tulips have begun to pop up in the spots that see the most sun. You don’t feel like hibernating any longer. You don’t have to travel very far to begin stretching your legs. Just a quick getaway will do. You’ve been meaning to visit the Barnsley Resort for years. The historic property lies northwest of Atlanta, as you head toward the borders of Alabama and Tennessee. A British cotton trader, who lived in Savannah, purchased 4,000 acres to build an Italian-style villa for his wife in the 1840s. Sparing no expense, the grounds were even designed by the architect of the United States Capitol and the White House. But the owner’s wife died before the grand estate was completed. It eventually became a chicken farm, and the great main house fell to ruin. It took more than 100 years for the property to be revived. But in the late 1980s, the grounds were renovated, the gardens were restored, and a peaceful resort opened. The Barnsley Resort is in the small town of Adairsville. Though only a half hour from Hartsfield–Jackson Atlanta International Airport, the busiest airport in the world, it feels much farther removed from the craziness of the city. Adairsville was a Cherokee village before settlers, the railroad, and the Civil War arrived. The Union defeated the Confederate soldiers in the Battle of Adairsville in 1864 during the Atlanta Campaign. It’s now home to cow pastures, golf courses, and beautiful gardens. By the time you reach the shingled Gatehouse, at the entrance of the resort, you’re already enchanted. From there, it just gets better and better. Tree-lined walkways veer off the gravel road toward cozy cabins. Little ponds filled with water lilies, blossoming quince trees, and rolling meadows fill the property. Wooded hills, cut by hiking trails, are in the distance. Plus the air feels clean and fresh. But back to those cabins. Rocking chairs and a stack of firewood sit on the veranda of your little brown one. It has hardwood floors and a comfy living room inside. There’s an armchair beside the fireplace, a sleigh bed in the bedroom, and a clawfoot tub in the bathroom. 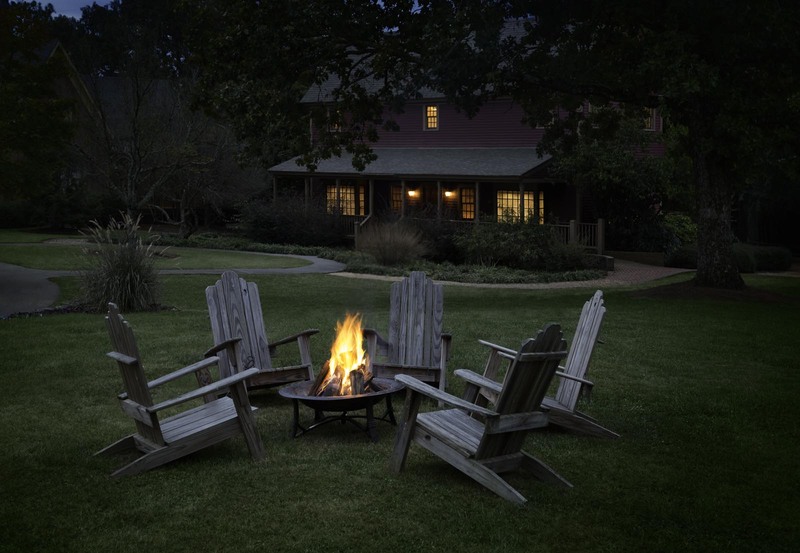 Adirondack chairs surround a fire pit outside. While, as if on cue, a flock of wild turkeys is walking across the lawn as you glance outside while unpacking. Between the tub and the stack of firewood, the part of you that’s still in winter mode could easily curl up in the cabin until it’s time for dinner beside another fireplace in the Rice House’s 1850s farmhouse. But as the temperature climbs, you’re reminded that you need to get outside. You pick up a map to take a self-guided tour through the museum and the gardens. The History Museum, in the villa’s former kitchen, features photographs of the original estate and artifacts from the Civil War. Daffodils, roses, and cherry trees fill the gardens. There’s even a herd of buffalo on the property. When your tour is over, you find the Beer Garden. From a wooden picnic table, you order a craft beer and bratwurst. By the time they arrive, you’ve started peeling off layers of unneeded, heavy clothing. Spring is definitely on its way.